Our ‘News from our Trainees’ section of the website has been very under-published of late, for which we apologise. We would like to reassure you all that this is not because there is no news! Tanya and Anthony got together this morning to have a think about what we’ve done through the year. Tanya – Sales Week/ Day – to encourage more customers. Christmas Crafts/ Jobs for the shop staff. Strawberries to harvest on high up stands in grow bags or window boxes, that we can access in wheelchairs. David I, would like us to grow roses and more daffodils for cut flowers. More herbs for the glasshouse and for sales. More cut flowers – liked drying all the Helichrysum and Stattice. Bryony – more fruit crops – loganberries etc. Bryony – peas and scallions. EVERYONE wanted more and more food crops. “Kehelland is a lovely place down here and all the staff are a really wonderful lot. Rachel did some good cooking in the kitchen today” Anthony. We have grown more flowers in the flower tunnel this year. 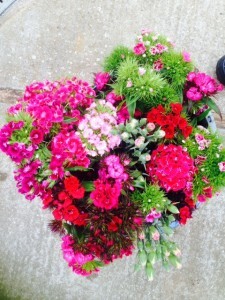 We bunched up and sold Daffodils, Sweet Peas, Sweet William, Pinks and more. Tanya remembered how to prepare the helichrysums for drying when it was nearly 10 years since they had last done it. Go Tanya! We also grew more Stattice and had a great crop of sunflowers. We will update this page a bit more regularly from now on!! !